It looks like the Firefox OS segment will have its first commercial launch in Europe and Latin America this summer courtesy of Alcatel. The Alcatel ONE TOUCH FIRE is an entry level smartphone, built on the popular browser based OS and designed to thrive in the open-source HTML5 environment. 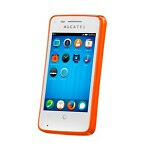 Alcatel touts the ONE TOUCH FIRE will be ready to go out of the box. The ONE TOUCH FIRE will feature a 3.5-inch 320x480 display, an MSM 7227 1GHz CPU, a 3.2MP main camera (no flash) and will be available in a variety of colors, like Mozilla Orange, Apple Green or Pure White. The ONE TOUCH FIRE can capture 30fps video at VGA quality and features a music player and FM radio. It is a 3G device supporting GSM/UMTS in the common bands (850/900/1800/1900/2100) and will support microSD cards up to 32GB. For a small sized device, the battery is 1,400mAh which Alcatel claims up to 6.7 hours of talk-time on 2G, about half that on 3G. While not earth-shattering specs in any direction, the ONE TOUCH FIRE is sure to be appealing in emerging markets in Central and South America and will certainly be an endearing option for those on a budget in Europe. As with many product announcements, we do not have any pricing or release dates, nor did Alcatel announce which markets would get the ONE TOUCH FIRE first. The company already has an established line-up of Android powered smartphones and the manufacturer was one of the first to announce its support of build equipment using the new Firefox mobile operating system. 25 JUNE, 2013 – ALCATEL ONE TOUCH introduces the Mozilla Firefox OS to mobile users for the first time with the ONE TOUCH FIRE, launching in Europe and Latin America this Summer. Available in a range of attractive colours, the ONE TOUCH FIRE offers highly optimized graphics on a 3.5” display within its compact and pocket friendly design. The browser-based operating system offers super-smooth navigation and let users discover apps in context as they navigate the web -- it’s never been easier to experience the web on the go the way you want it. Coupled with a 1GHz CPU and 3.2MP camera, the ONE TOUCH FIRE is the ideal entry-level smartphone for consumers who want to get online, share media and stay in touch. Already the choice of 550 million users worldwide for daily web browsing, the Firefox OS opens up the world of HTML5 apps to mobile users, giving them a seamless, highly customizable online experience on the go. The open web standards allows HTML5 developers to create apps that access the underlying capabilities of the device, improving mobile web performance and delivering bespoke tweaks and creative add-ons for every user. The ONE TOUCH FIRE arrives ready to use right out of the box. With a wide variety of colours to choose from and a selection of accessories, it is up to you to choose the perfect smartphone and dress it up to suit your personality. ALCATEL ONE TOUCH is a brand within TCL Communication, an international multicultural company which designs, develops, and markets globally a growing range of mobile and Internet devices. One of the fastest growing of the world’s top ten mobile phone manufacturers, TCL Communication makes access to mobile technology simple, designing their products around individual’s lifestyles, enabling the end users to do more. TCL Communication is a public company listed on the Hong Kong Stock Exchange (2618.HK) and part of TCL Corporation one of the largest consumer electronics companies in the world. If they offer this device around $100 then I may pick one up. It would be a great way to try out a new OS without feeling buyers remorse if I don't like it.